On the front endpapers, young Julián, wearing red swim trunks, joins his abuela and her friends as they swim in the local pool. While the adult women hold on to the pool’s wall, Julián swims like a fish, happily blowing air bubbles. On the back endpapers, Julián’s abuela and all her friends—still wearing their swim caps and patterned bathing suits—have become mermaids, the pool has become open water and all of them are submerged and blowing bubbles. At the forefront is Julián, a purple mermaid with a long yellow tail, his hair loose and flowing. He’s looking directly at the readers, inviting them to join the party. In an exemplary model of “show, don’t tell,” Love limits her-matter-of-fact text (“This is a boy named Julián. And this is his abuela. And those are some mermaids. Julián LOVES mermaids.”), and employs her luscious art to welcome young readers into Julián’s world. As the story begins, we meet Julián and his abuela, returning from the beach and headed towards the subway. Julián is holding a large picture book about mermaids that his abuela has given to him. When the two sit down, Julián turns to his abuela, his eyebrows raised, questioning. Soon after, three fabulous turquoise mermaids board the train and one waves at the entranced Julián. In a dream sequence inspired by the pictures in his book and by the three mermaids, the train fills with water as Julián strips down to this tighty-whities and transforms himself into a fabulous mermaid with long, flowing hair, a purple lower body and yellow tail. In a sea of gorgeous turquoise-green, he swims with a variety of sea creatures, and accepts a necklace from a large blue fish with white patterned scales. Hold that thought, and look for the blue-and-white pattern later on. Copyright © 2018 by Jessica Love. Reproduced by permission of the publisher, Candlewick Press, Somerville, MA. Abuela wakes him. It’s time to go. Julián and the mermaids wave to each other. On their way home, he asks Abuela if she had seen the mermaids. “I saw them, mijo,” she says. As the two reach their front door, Julián tells her that he is also a mermaid. Now, having come out to her, Julián’s posture has changed. He’s standing tall now, relaxed and smiling. While Abuela takes a bath, Julián has an idea. He strips down to his tighty-whities again, creates a headpiece with wavy fronds from Abuela’s potted fern and flowers from her vase and a mermaid’s tail from a gauzy, flowing curtain, and finishes the look with Abuela’s purple lipstick. He. Is. Fabulous. As he reaches for a hanging philodendron, Abuela comes out, looking upset. Uh-oh. She retreats to the bathroom and soon emerges—in a blue dress with white patterns. And she gives Julián a necklace. Together, they walk to the Mermaid Parade, where she tells the shy little boy, “Like you, mijo. Let’s join them.” And they do. In the parade are many of the sea creatures Julián had swum with in his dream sequence and, at the head of the line are the three mermaids who had been on the train. Julián waves. They wave back. Everyone is fabulous. Love skillfully uses vibrant watercolors, gouache and ink in mostly double-spread, full-bleed illustrations whose vivid details virtually glow against the soft matte background of brown kraft paper. She lovingly depicts the broad range of complexions and body types and ages of the community’s women; and attends to small but important details, such as Julián’s raised eyebrows when he’s trying to figure out Abuela’s expression, or a slight slump of his shoulders when he’s not sure of something, or his chin held high when he becomes part of the parade. There is also not-so-hidden symbolism, such as the relationship between Abuela and the giant blue fish, or that between three girls joyfully playing at an open fire hydrant and the three mermaids Julián meets on the train. In addition, many of the full-bleed, double-page spreads are wordless, so child readers can discern the action without being told exactly what’s happening. And not least importantly, it’s refreshing to see Spanish words that are not italicized. 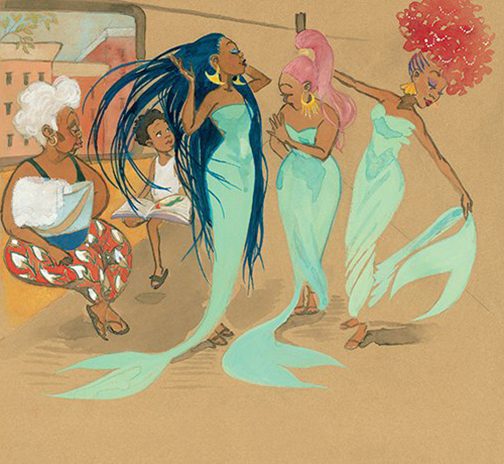 In giving Julián this picture book about mermaids, Abuela is both acknowledging and encouraging his emerging self. In this sense, it’s clear that both Julián and Abuela have agency. Throughout, their relationship is strong; he questioningly looks to her for guidance, and her loving affirmation feeds his spirit and enriches his life. When Julián quietly tells his abuela that he is also a mermaid, the little boy is telling her that he’s finding his place in the world. And, on the end papers, when he joyfully swims with his own abuela and the community’s other abuelas—all of whom are also mermaids—he’s claimed his own identity and has found his place. While Dominican American children who live in Brooklyn will recognize the people, the neighborhood, the G train to Coney Island, and, of course, the annual Mermaid Parade, the author wisely leaves the door wide open, so to speak, as an invitation for other children to enter the story as well. Throughout this delightful, life-affirming picture book, young readers will see young Julián growing into the person he was meant to be. 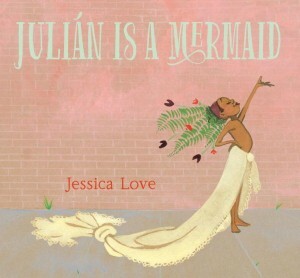 Full of love and joy, Julián Is a Mermaid is for all questioning children and children who may not conform to the “norms” of their genders—and for everyone else as well. Julián Is a Mermaid is highly recommended. Míl gracias a mi coleja y amigo, Noam Szoke. You’re FABULOUS!